This isn’t a mess—it’s a pile of unprocessed records at an archive, and buried within may be clues about your family history. Eventually, these items may be filed away neatly for you to find. But how can you access them in the meantime? As an archivist who works in an archive every day, I get very excited when someone walks through the door with a records donation in hand. Many of our archives would not have the genealogical and historical records they have without the generosity of others. Archives receive donations of documents, photographs, ephemera and artifacts—almost on a daily basis. 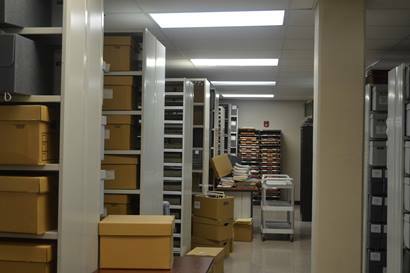 Many archives have back rooms full of unprocessed and uncatalogued records collections. Sometimes they are even sitting in the original boxes they were donated. These records collections have not been microfilmed. They are not online anywhere. 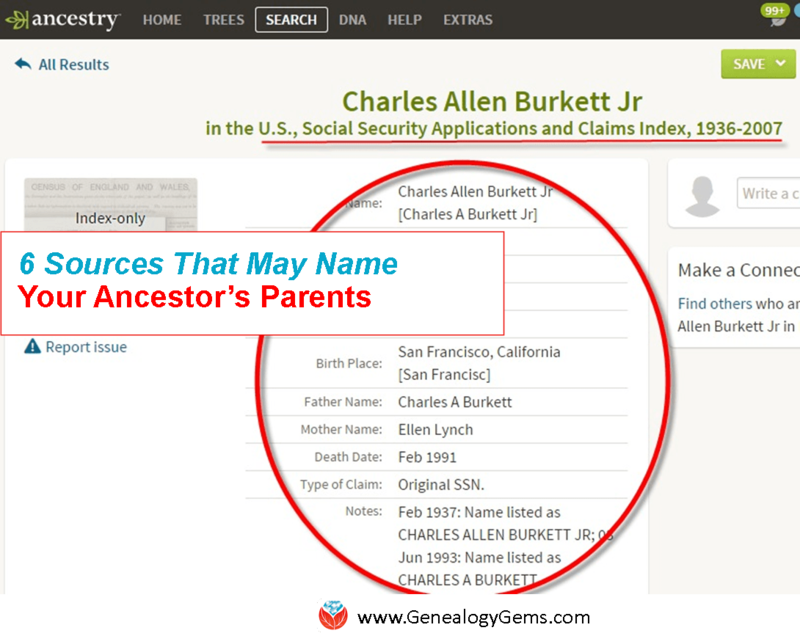 But they exist and the genealogist needs to seek them out. If you are emailing or talking to the archives by phone, be sure and ask about any new records collections that have been processed or that have recently been donated and are waiting to be processed. Most likely, you will have to travel to the facility to see the records but you can get an idea of what is available. Remember, the answer to your genealogical question could be sitting in a box of unprocessed records. 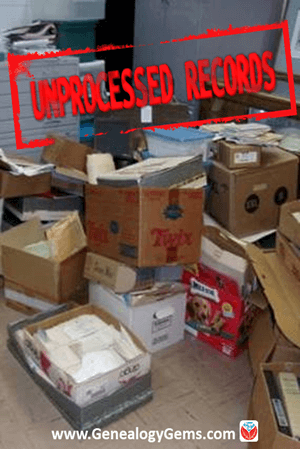 I like to always encourage genealogists to put “unprocessed records” on their to-do list. As genealogists, we should leave no stone (or box of records) unturned. Make a quick list of your ancestral surnames, time periods and places that might be mentioned in records a particular local or regional archive. Then add the names of local organizations with which your family may have been affiliated (schools, industries or businesses, churches, local militia units). Finally, jot down a few kinds of original records you’d love to find, such as photos, maps, news clippings, business or church records, militia rosters and the like. With this “wish list” in hand, look first for any processed records. Start at ArchiveGrid.org, an online catalog of collections at thousands of archives. 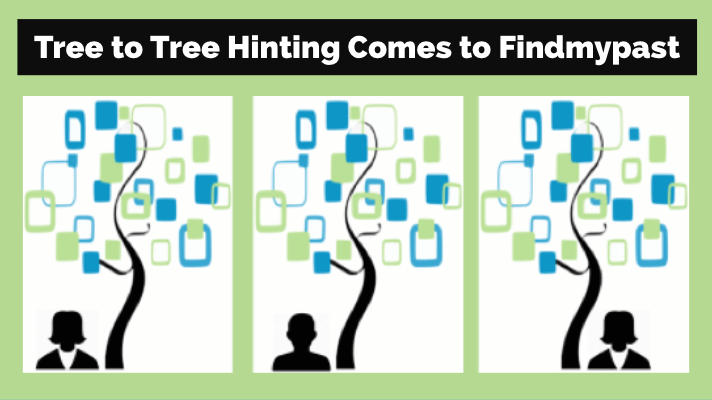 Enter different combinations of your search terms as keywords. If you have a specific archive in mind that’s not coming up at ArchiveGrid, go to that archive’s website. Search any online catalog or digital finding aids (collection descriptions) with different combinations of your search terms. Or use Google site search to let Google help you look for your keywords across the entire site. If you don’t find what you’re looking for, call or email the archive. Mention that you’ve already searched online for items relating to your family. Ask whether they may have any additional items pertaining to your wish list (people, places, organizations, record types) that haven’t yet been processed or may not be on their website or in Archive Grid. Ask whether or when access might be available. Melissa is a Certified Archives Records Manager, the Houston County, Tennessee Archivist and author of the popular blog A Genealogist in the Archives and an advice columnist. She has been researching her own family history for the past 27 years. Images courtesy of Melissa Barker and Houston County, TN Archives. As a professional archivist, I would urge extreme caution in this approach. While it does not hurt to ask about WHEN new collections may be available, 99% of archival repositories will NOT allow you to use their unprocessed collections. This refusal is based on accepted access standards – we cannot allow patrons to use unprocessed collections because an archivist, as the new steward of this collection, has to make a professional assessment first before allowing the public access. We have to assess the condition, arrangement, and complete contents of the collection as part of the processing duties – followed by re-housing and stabilizing the fragile components. If the public is allowed to use the collection prior to processing, the arrangement, condition, and security could be at great risk. At most, researchers can only reasonably expect to get an estimate as to processing completion, resulting in access at a future date. By calling and expressing interest, it might push a collection ahead of the processing line – but please do not get upset at your local archivists for doing their job – it is a very time consuming process, yet the benefits will be enjoyed by future researchers for many years! Hello Cheri! Thank You So Much for your comments on my article. Being a professional archivist myself, I completely agree with what you said about processing records in an archives, it is so very time consuming. 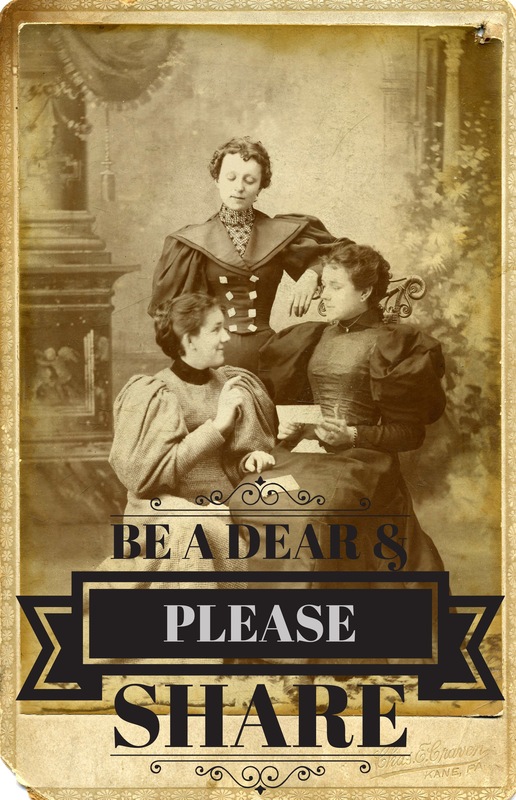 I do like to encourage genealogists to ask about unprocessed records even though many archives do not allow viewing of these records before they are totally processed. I have had my own experiences in archives (before I was an archivist) where I asked to know about or see newly donated records or unprocessed records and I have had some really good success in being able to view and research in these types of records. Not all archives allow it, which I completely understand but it never hurts to ask. I have communicated with some authors that were doing research for their books and have gained access to unprocessed records because they could show the importance of those records to their work. The main thing is to respect the archives and archivist and their rules, regulations and wishes. Again, Thank You for your comments.